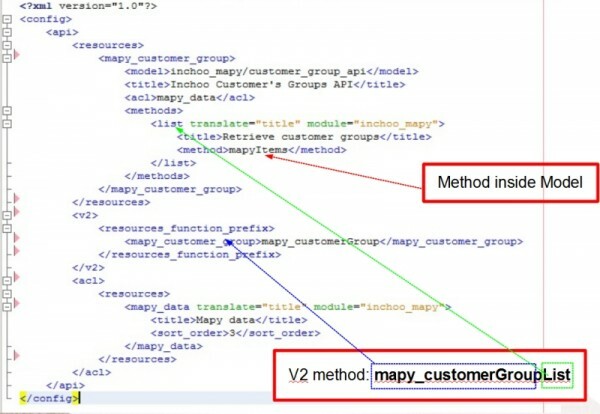 Last few weeks, i often see confused people asking questions about difference between Magento’s API v1 and v2, and also bunch of questions about how to use WSDL and WS-I files when developing own or extending existing Magento soap API v2. It is obvious that short articles about specific Magento API parts will not help them to get the bigger picture about Magento core API v2. Because of that, I decided to demystify practical usage of Magento API v2 and also to explain difference when using v1 and/or v2 API. 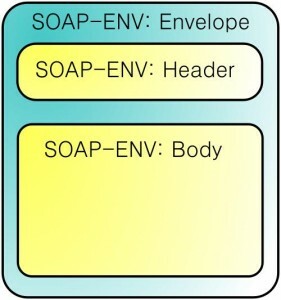 SOAP = Simple Object Access Protocol. It is based on XML mostly via HTTP (POST). 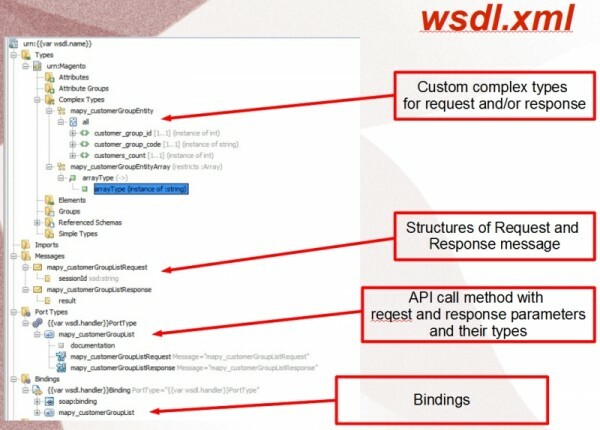 WSDL stands for: “Web Services Description Language”. It is basically XML – based language that is used for describing the functionality offered by a web service. There are two possible versions of WSDL: WSDL 1.1 and WSDL 2.0. 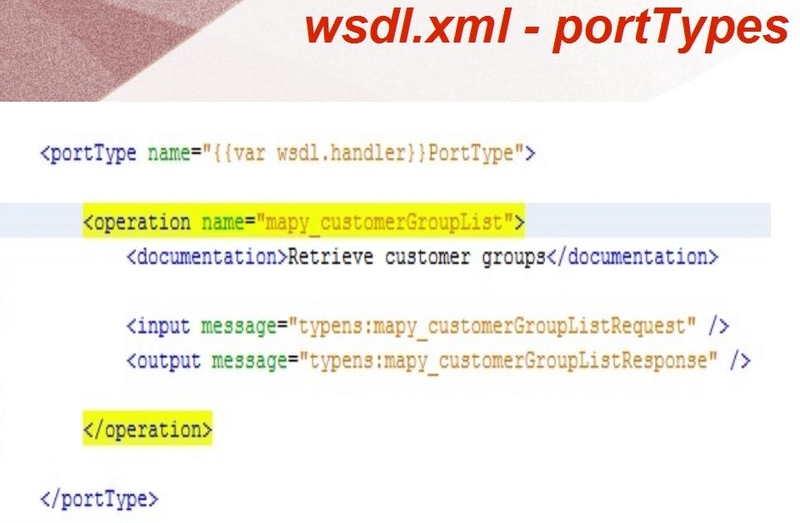 Since Magento uses WSDL 1.1, I will continue with this WSDL version in this article. First we should define appropriate roles for web services user, so, log-in to admin panel, go to menu: System/Web services/Roles and click on Add New Role button. On “Role info” tab, we need to enter some custom Role name, and then click on Role resources tab, choose wanted role resources and Save Role. Role resources necessary for usage with API are basically defined in each Magento module’s api.xml file in etc folder, and can be checked there what role resources are needed for successful consuming specific API method. 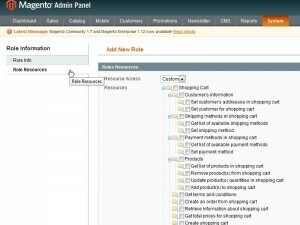 After creating role, let’s create web services user that will have defined role permissions. Go to menu: System/Web Services/Users and click on “Add New User” button. Under “User Info” tab fill the fields, and pay attention that “User Name” and “API key” values are values that we will use on client side to access API. After that, we just have to click on User Role tab and click on radio-button to assign wanted role to current user. After that we just need to click Save User button. 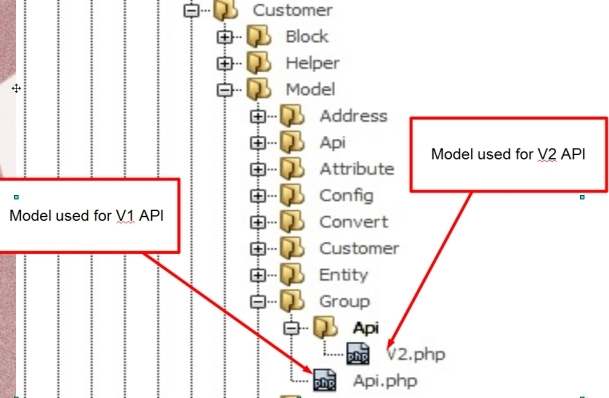 If you compare those two versions of API calls, you will notice that v1 uses method “call” for ever requested method, and v2 has defined full method name to call. 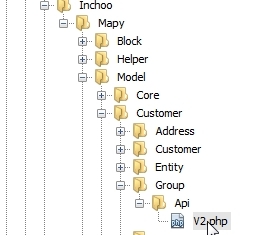 Basically, API v2 calls method same way like v1, but there is some kind of wrapper around call method in v2. 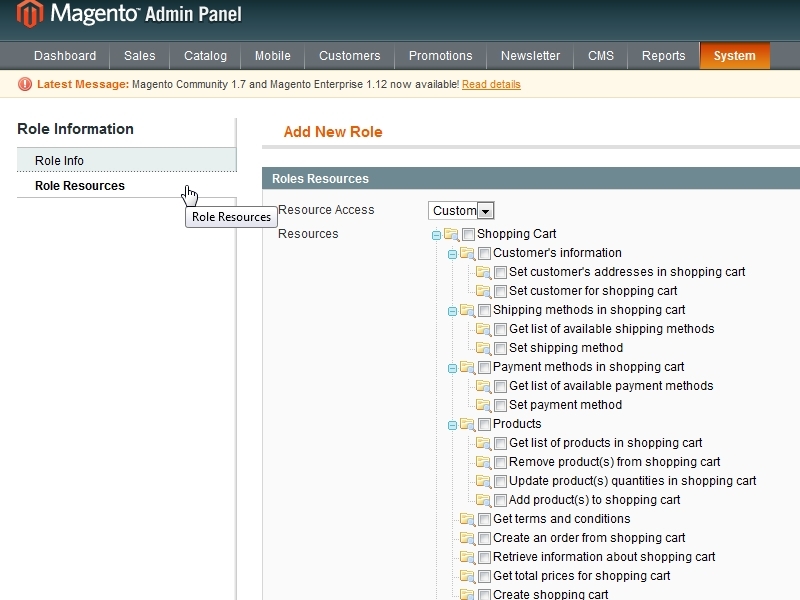 Somebody will ask: Why Magento did something like this? Why would somebody make different methods for accessing API when we have “call” method already? 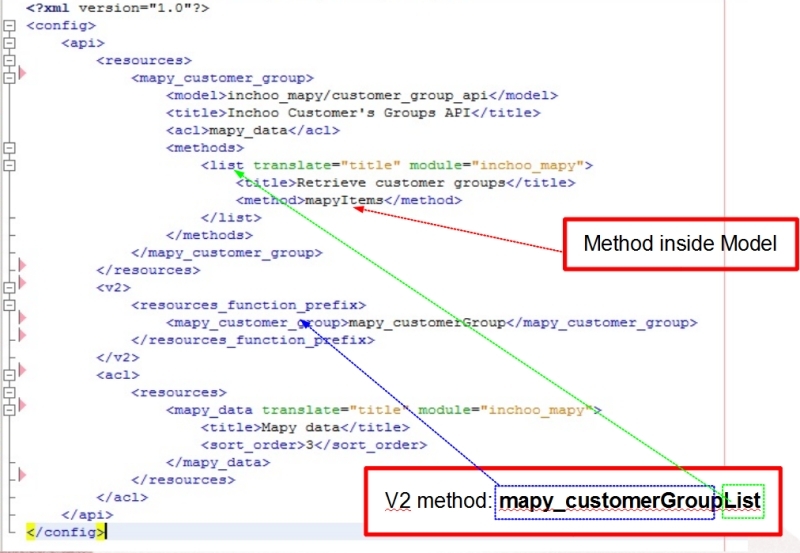 Here comes the basic difference between v1 and v2 API in Magento. 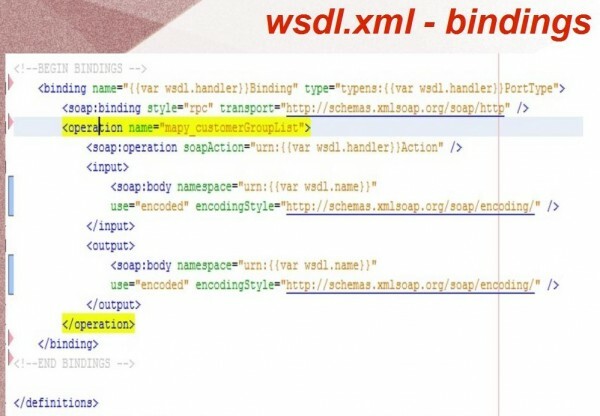 To demystify that, we should first look at and compare WSDL for v1 and v2 API in Magento. 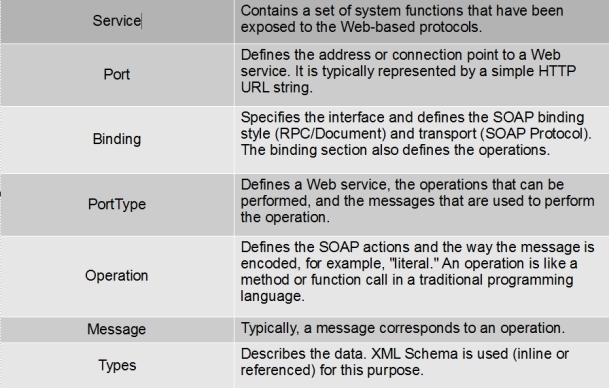 But, if we look at http://yourserver.com/api/v2_soap/?wsdl, we will find that there is bunch of methods defined inside. Imagine that you want to use some generator for SOAP methods to auto-generate your client-side classes end entities for consuming web services. 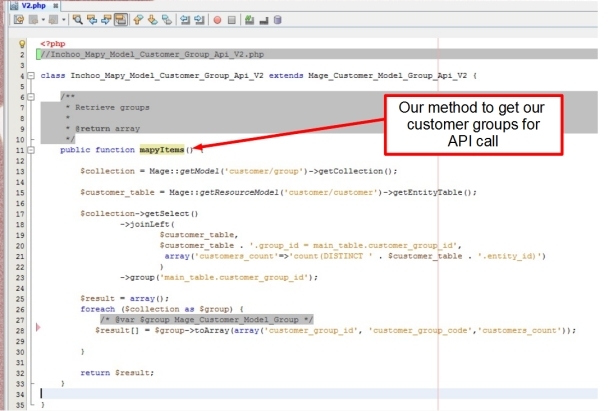 When using Magento v1 API, we access resources via call method and provide API method name and parameters as parameters of call method. When using Magento v2 API, we access resources via real method name and we provide parameters as defined in WSDL for each specific method. OK. When we got this difference, and showed how to consume SOAP, let’s focus on creating own web service methods compatible with API v2. Here is logic that has to be implemented in api.xml file. Api.xml file basically connects API calls with php methods inside specific models. Also, the ACL resources are defined here for specific api call. 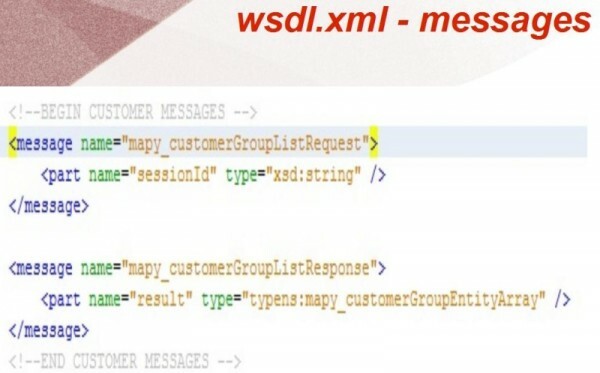 There are few things that we have to fill-in when creating wsdl.xml. Also, it’s easier to copy one of Magento’s wsdl files, paste it in our etc folder and remove unnecessary things and add our own inside. After we finished with wsdl, let’s go to http://ourmagento/api/v2_soap/?wsdl=1 to see changes in global wsdl we made. (Don’t forget to clear cache first!). 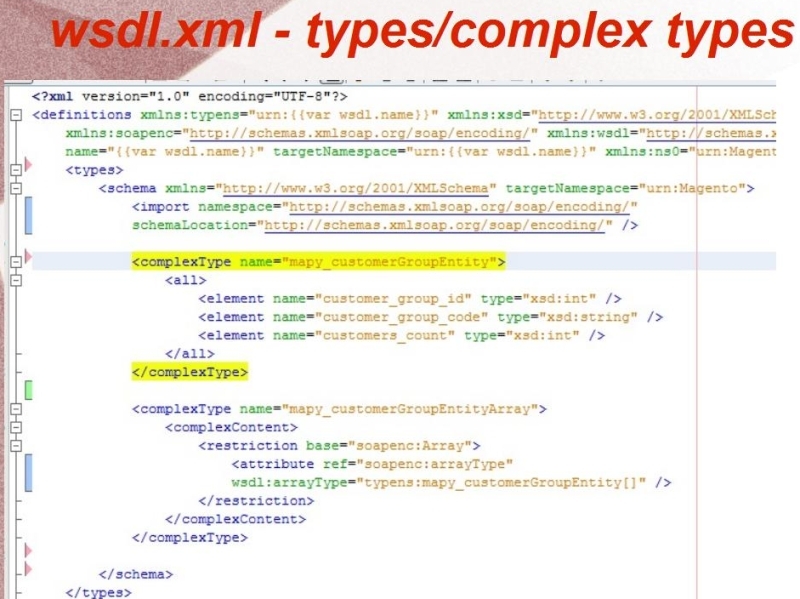 We can see that all wsdl.xml files including ours are rendered as single. All available wsdl definitions for current Magento installations are shown and our definitions should be there. Now we are ready to use our newly created SOAP method. – WSI is in basic compatibility layer for different frameworks and provides a little bit more information that can be used for example with XSLT to transform definitions into our client source code. – It’s not essential in order web services to work. – It is rendered when: Magento admin: System/Configuration/Services/Magento core API/WSI-Compliance configuration value is set to “YES”. Let’s copy/paste one of Magento’s wsi.xml inside our etc folder first. After that, let’s delete all unnecessary definitions for our SOAP method. Adding definitions inside WSI except for slightly different definitions are basically the same as for wsdl.xml. If you are using existing wsi.xml, it’s easy to delete unnecessary and rename few nodes to suit your needs. Just follow the rule to fill all of this in the above list (Bindings, Port types … ). Here you can download archive with basic wsdl.xml, wsi.xml, api.xml so you can easier start writing your own web service methods. Just put these files in your etc folder, rename appropriate things with your own and that’s it. That would be all for now. If interested in Magento API, stay tuned. In case you would like to make your store even better, feel free to drop us a line. Our technical audit is designed to identify not only problems but also solution when dealing with Magento mysteries! 1. Can we create User and Role necessary for accessing SOAP APIs during installation of custom extensions so that user doesn’t have to create them manually as mentioned in this tutorial? 2. Can I write a universal SOAP extension that can be installed on both magento 1 and magento 2? That extension will access all default SOAP APIs and some additional custom APIs. This tutorial is working great..
Hi, i would like to call Magento API functions from 3rd party frameworks, would working wiith API be thee right way? 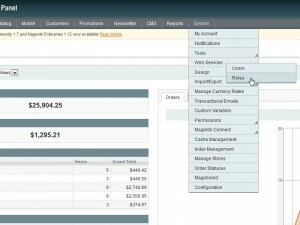 Is there any way to make a multicall sort of thing with Magento SOAP V2? I need to fetch details of multiple products in one call and i’m unable to do so with V2. This is very interesting. Do you have a solution to update products in a order? We add some custom attributes to our products, like “product_processing_status”. Now we have a order with some products. I read the product data from the order with the SOAP V2 API. How i can retrieve the custom attribute “product_processing_status” with SOAP V2 and update them with a new value in the order? I am facing same scenario like. Did you resolved the issue ..? If you resolved please let me know the root cause of the issue. I’m trying to connect with magento allocated in a remote server using your instructions but I get Uncaught SoapFault exception: [WSDL] SOAP-ERROR: Parsing WSDL: Couldn’t load from ‘http://www.prueba.com/api/soap/?wsdl=1’ : failed to load external entity “http://www.prueba.com/index.php/api/soap/index/?wsdl=1”. But when i try the same code on my local magento it’s work properly, and they have the same configuration, users and roles. Is there any special method to connect with magento in a remote server? 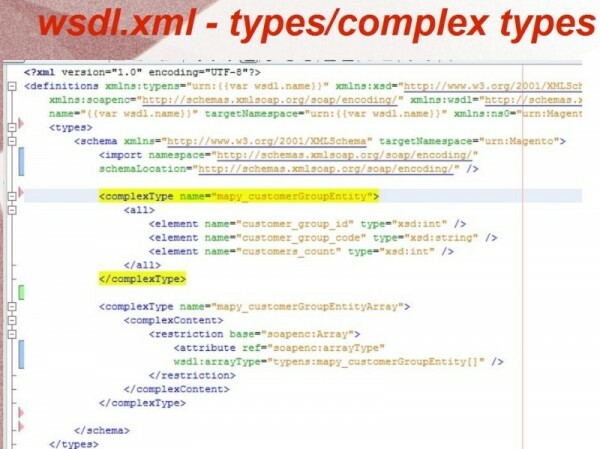 What purpose of file api2.xml ? I dont want to load wsdl.xml file of Catalog and Sales module in my SOAP WSDL Url. Hos can i do that? Iam new to magneto can you please tell where i put SOAP connection file and the folder structure. I have to modify sales order info() method of API. I want’s to show street field values in two different fields street1 & street2. I have a cluster of servers (2 frontend, 1 database-write and 1 database-read) and I install the admin panel in the server of database-write with the domain name http://backend.innovasport.com. The admin panel works fine, but the Web services doesn’t works with the custom admin url. 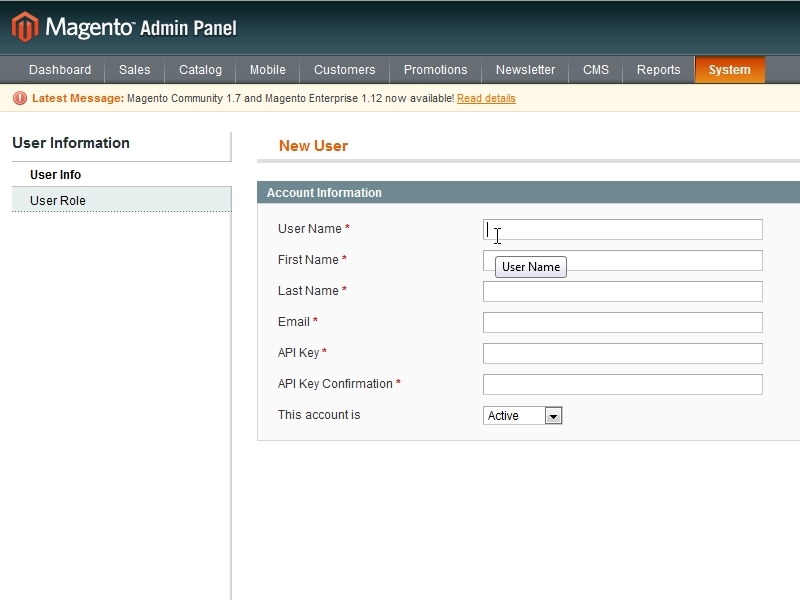 I’m new learner ,please help me how to enter magento login page directly from java code(step by step ). Above php code is not working for me. The code is used to get list of simple products. Any admin settting needed for that ? i have created user and assign role to it. Attached is an example set of code that is failing with the error “javax.xml.ws.soap.SOAPFaultException: Unknown error”. I am trying to use the multicall option in the java soap v2 api. Any ideas how to make the calls to it? I am not finding anything online to give greater clarity as to the types of objects that will be sent to the server. I got it working like this. 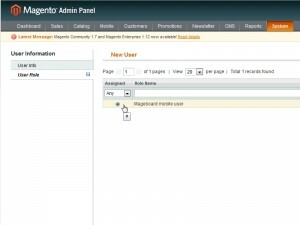 I am trying to use Magento web services by posting SOAP_V2 XML. I’m having lots of success but one attribute that I receive, group_price, has a value of “array”. It’s not surprising to me that group_price is an array. 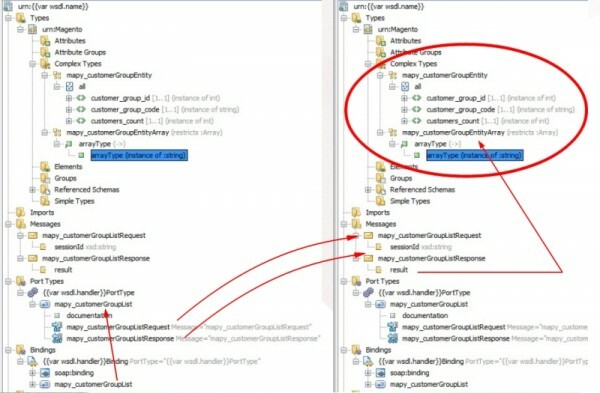 But how can I specify in the XML that I want to retrieve the group_price for customer_group=4 ? Im getting some troubles creating a custom methods in the SOAP Service of Magento, but this problems happens when the Page Cache is active, otherwise it works just fine, and when I activate the cache the connection with the web service displays an error that can’t find definitions in the wsdl. I don’t know if having the Page Cache disable can damage the performance of my store. 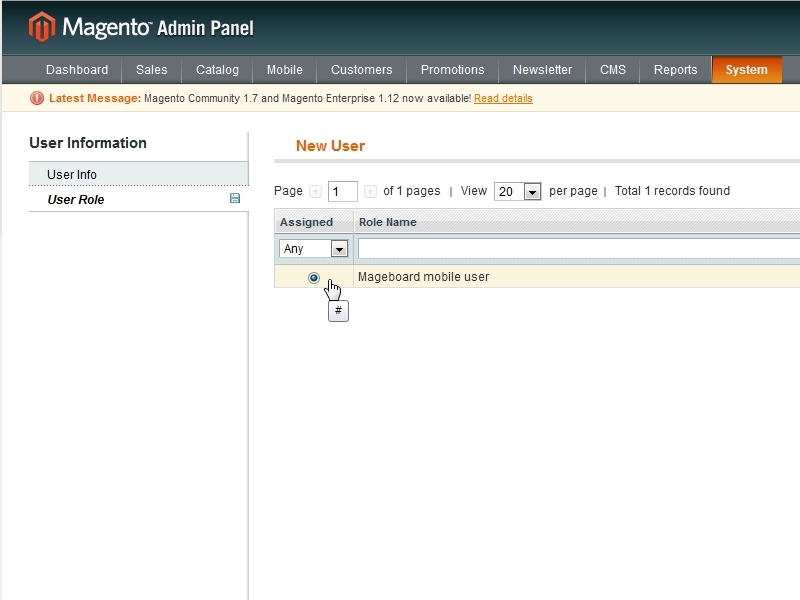 i am trying to use magento web service with java. Could you please help me with this? I stucked at one point while trying to create the webservice with reference of this post. 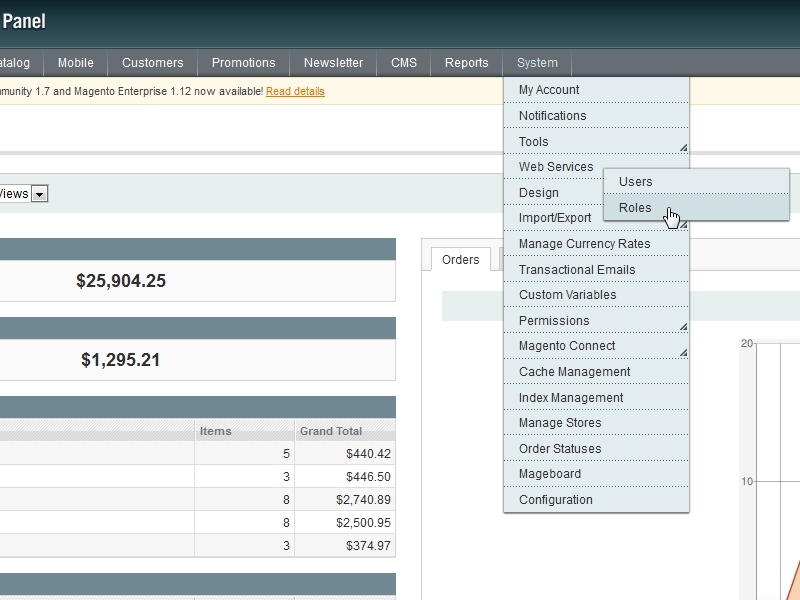 All the parameters are displaying in the WSDL file when its viewed from browser with the URL. I mean complextype, request/response param and request/response messages. But my method is not being displayed when I make call to $cli->__getFunctions(). Can you please help what am I doing wrong? When I checked the file and line specified my file is identical to the original file from magento download. (I can post the line if you would like). I am unsure how to fix this, nor do I have a clue where to look next for the source of the error. Any clues or help will be appreciated. Which SOAP Version has better performance V1 or V2? I think is V1 by using multiCall. Is there a method in V2 similar to multiCall in V1? 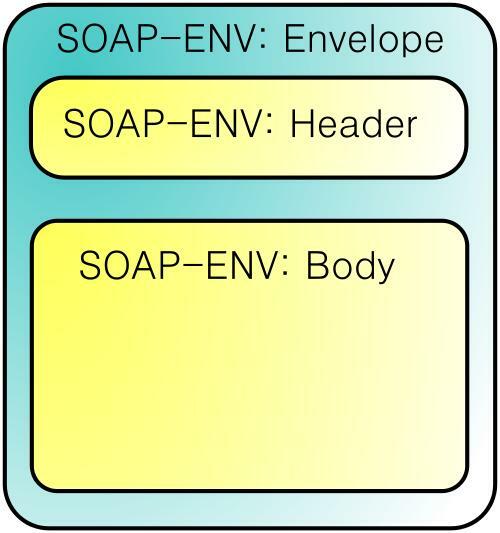 wsdl and wsi files are mandatory for soap v1 ? Could you please suggest where (which folder) to put this wsdl.xml? I have created the extension and put api.xml and config.xml in etc folder. But not sure about wsdl.xml. @Theperumal, please use apiKey ou defined in admin as password. 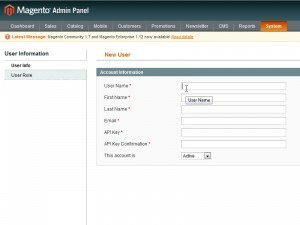 While creating webservice user and roles in magento admin, we do not specify any password there.